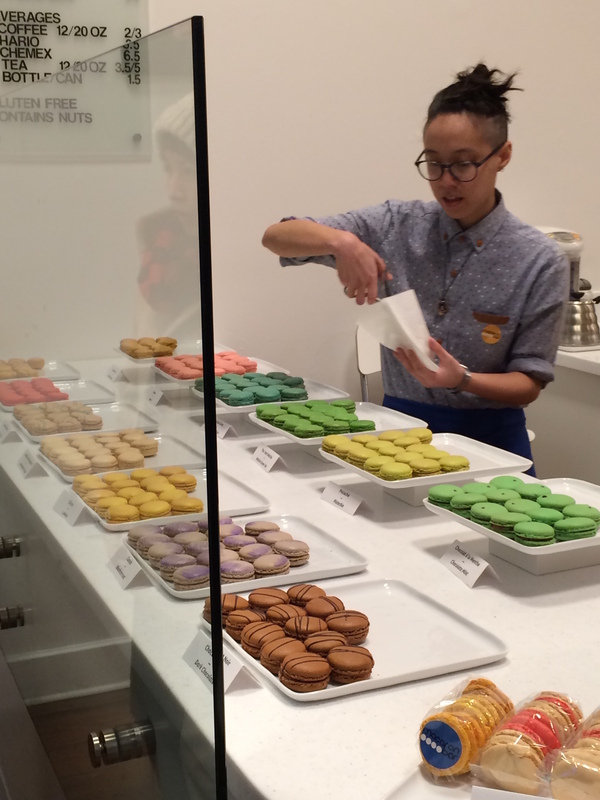 Gomez Salsa, Halfcut, and Macaron Bar – Go There. Try That. I love Mexican food. I especially love small, independent restaurants that serve up incredibly fresh tacos and salsa. Gomez Salsa has been on my radar for a while. I think this place originally started as a food truck so when I found out they had an actual brick and mortar location, I was there! What I did not know, is that it’s a walk-up/takeout establishment only. As of now, they do not have an eat-in dining room. Lucky for us, it was nice outside. The cool thing is that if you’d like to sit down and eat your food, Gomez has an agreement with several bars in the immediate area; so, you can place your order and then eat your food in one of the local drinking establishments- just be sure to order a beverage or two. I will say, by the time we left OTR, there was a long line of people waiting to get their Gomez on. This is Mexican street food at its best my friends. When it’s warmer, I’d love to grab some taco takeout and walk over to Washington Park! The price point is similar to Chipotle and they have super late weekend hours. We were newbies and needed to ask a lot of questions because I wanted to get the most out of my order! 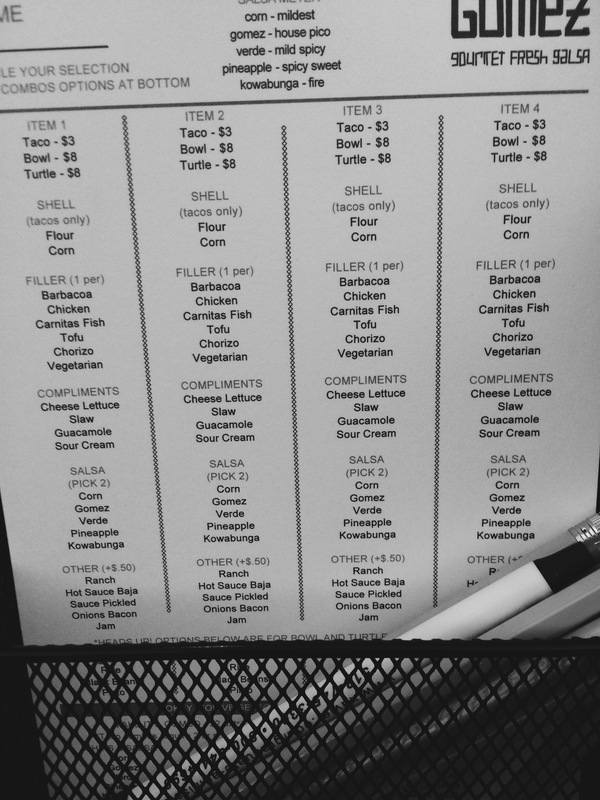 First, you need to take one of the paper menus, kind of like a check-list, and build your order. We each got a taco, a turtle, and chips and salsa. This was plenty of food. Just as I’d dreamed, the food was fresh, hearty, and delicious. The star? Well, let me talk about this turtle. Think combination of burrito and tostado. Soft shell on the outside, crunch in the middle. This big sandwich/taco is sealed with cheese and it is delicious. I got the slaw on top, my husband didn’t. I think the slaw makes the dish. 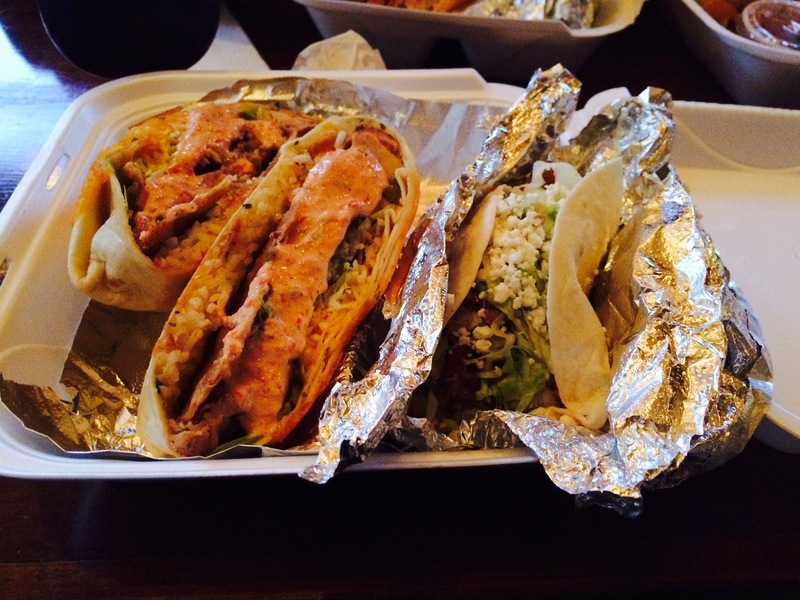 As far as meat options, you can pick from chicken, fish, carnitas, and beef. We sampled several and while it was all good, the tender, marinated carnitas is where it’s at. Yum! They do have veggie options for the non-carnivores. Oh, I must not forget the salsas. There are five salsas to pick from and between the two of us, we tried them all! My favorite, the Gomez and the Kowabunga! My only complaint, I wish they provided more salsa with the chips. 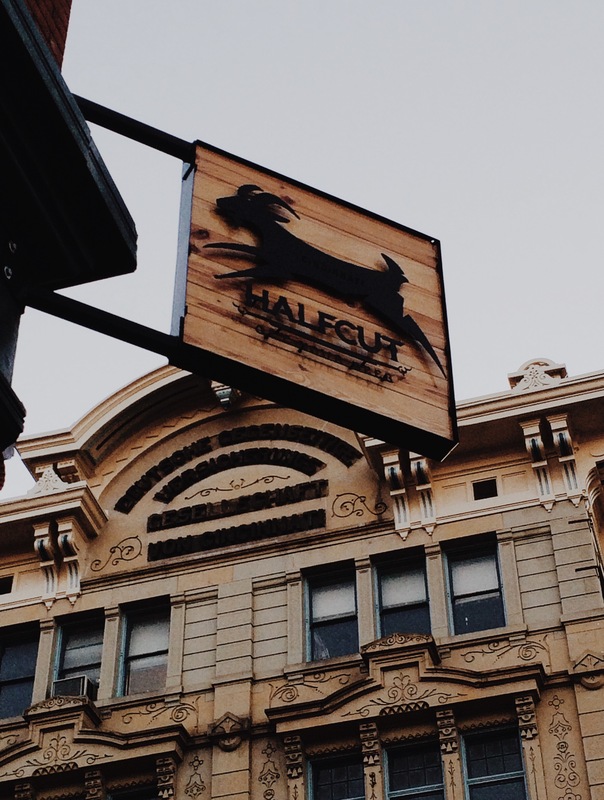 We weren’t taking our order to go, so we found a seat next door in Halfcut, a warm, but small bar with about sixteen craft beer choices. What made the experience even better? We sat at a long table, our food was delivered in to us from Gomez, and we chatted away with a New York City native who recently moved to Cincinnati. We gobbled up our turtles and talked food with a new friend. My kind of night. Oh, and while I had a good old-fashioned can of coke, my husband ordered a Coca Mole New Belgium. His description: chocolaty without being too sweet; it has a slight taste of pepper. He approved. We topped this goodness off with a visit to the Macaron Bar for desert. 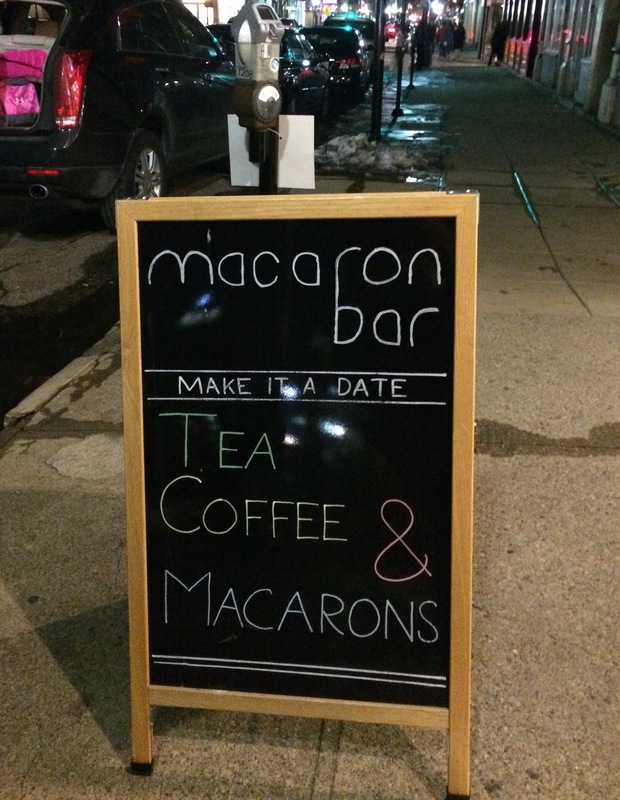 I will be honest, I had never eaten a macaron before. What I appreciated most was the array of choices. We took a box of 6 to go: salted caramel, Earl Grey Tea, dark chocolate, mint chocolate, blackcurrant, and lemon. Earl Grey Tea wins the prize for most interesting (in a good way). However, I’m a mint chocolate girl all day long! Overall, an awesome date night filled with new experiences. 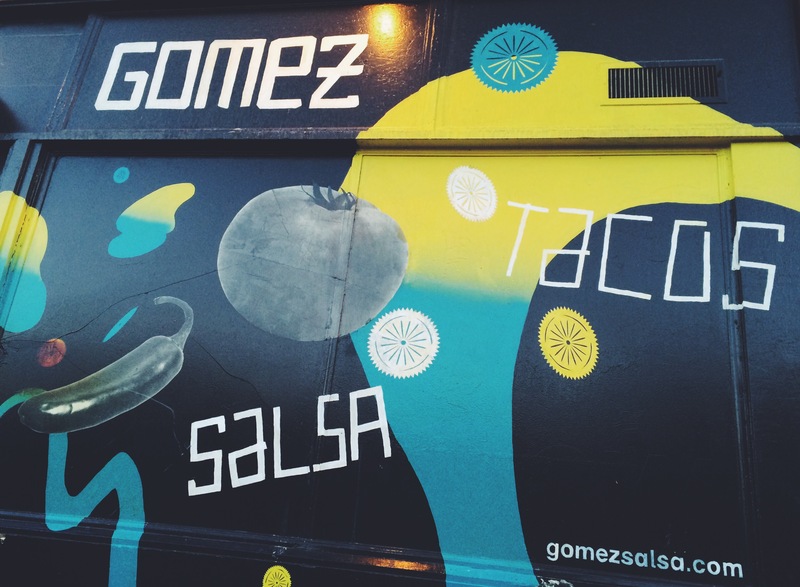 GO THERE (Gomez Salsa)! TRY THAT (turtle)! Ok, I HAVE to try this turtle thing! Sounds amazing! And the macarons! You know I love me a good macaron. 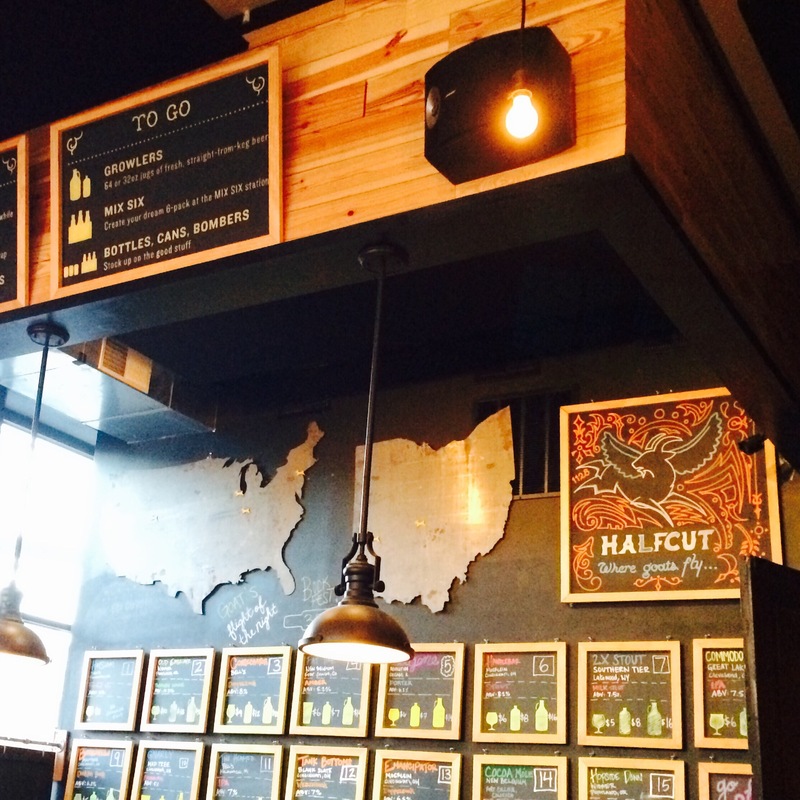 So I DEFINITELY need to try these places! You’re painting a picture for me of all the places you visit. I love it! we tried Gomez last night! Had the carnitas turtle! It was amazing! Thanks for the recommendation!